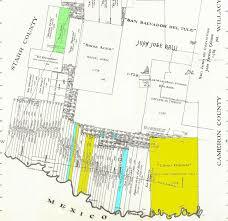 The commissioners heard evidence in Laredo, Brownsville, Eagle Pass, Rio Grande City and Corpus Christi in 1850 and 1851. During his travels Miller took a voyage from Port Isabel to Galveston on the steamer Anson. On the second day of the voyage the Anson sank in a storm. Miller survived but he lost his trunk which contained original titles submitted by land claimants, among them original Spanish and Mexican documents obtained from Mexico. As a result the Commission had to redo much of its work, relying on affidavits and copies of documents. On February 10, 1852 the legislature confirmed 234 claims in the names of the original Spanish and Mexican grantees and their heirs and purchasers, following the commissioners’ recommendations. The legislature also confirmed several claims the commissioners refused to recommend, including those for the Llano Grande and Las Mestenas grants in Hidalgo County, belonging to the Hinojosa and Balli families, and the San Salvador del Tule Grant, one of the largest grants in Texas. Seventy additional grants were later adjudicated, and many other claims were separately tried in court proceedings under laws enacted as late as 1901. Although the adjudication of titles after the war was quick and favored Mexican land tenure, later actions by Anglos deprived many Mexican owners of their title by dubious means, and controversies over Spanish and Mexican titles have continued. Most recently, in 2013 the legislature created the Texas Unclaimed Mineral Proceeds Commission in response to claims by Hispanic citizens that vast amounts of money were being held as unclaimed mineral proceeds by the Texas Comptroller of Public Accounts that should belong to descendants of Spanish and Mexican land grant recipients. I wrote about this commission’s work in 2015. It concluded that there was no basis for such claims. Under the treaty, Texas law regarding titles to land granted by Spain and Mexico is determined by the laws in effect on the date of the grant. As a result, Texas title attorneys must be familiar with Mexican and Spanish laws in effect when the grants were made, including those related to water and mineral rights and littoral boundaries.